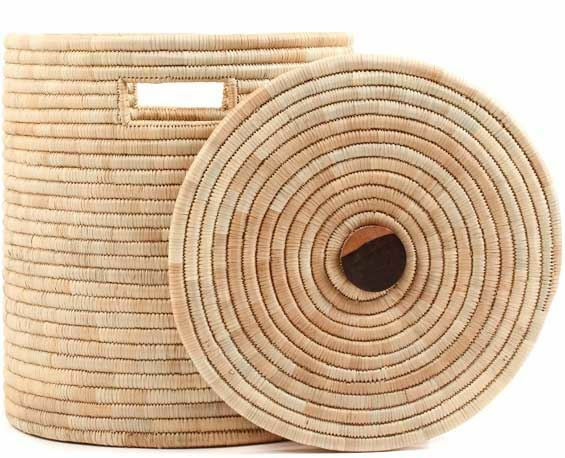 Weighing ten pounds, this all-natural basket is beautiful, very sturdy, and useful! The wood handle is smooth and the lid fits snugly to keep small treasures inside. Malawi is a small, landlocked country in Southeast Africa. Originally this weaving group had three members in a small village who were working hard to revive the art of Malawian basket weaving. Now the weaving group has 35 members. They proudly create sturdy, coil-woven baskets from local grasses and palm leaf. These baskets are all-natural. The dyes are made from plant materials.